Love love loved this one! Poor Landry had a rough start and made some tough decisions and had a very relatable, human, knee-jerk reaction to a situation. Loved seeing how these two worked through things to come back together. Especially loved the hints at the next book to come - Pru & Hoax... feeling a Boomtown re-read coming on. I've only discovered Lani Lynn Vale's books few months ago but she is fastly becoming one of my all time favorite authors and a #1click addiction. So it is not a surprise that I was super excited to get my hands on How About No. 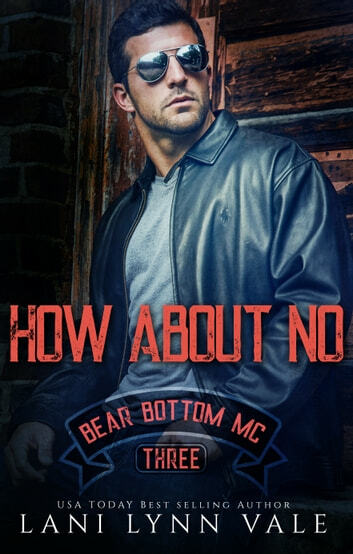 I am simply in love with the Bear Bottom MC characters and from the very start I wanted to know what was Landry and Wade's story. Well, I can tell you that it was definitely not what I expected. But it was still so good. It is simply a heartbreaking story about second chances and fighting for the one you love with a side of hotness and sprinkle of danger. As I already mentioned, Wade and Landry's story was definitely not what I expected. In a way, it was so much better. To be honest I was nearly in tears from the moment I started reading the prologue. It was just so emotional and heartbreaking. And it just got better after that. There were times when I was getting really frustrated with Landry but once I actually found out more about her past, I started understanding her better. As for Wade, he is a huge hottie. In addition to that he is a understanding, protective, and even tender when his woman needs it. But he can be also very dirty in the most delicious way there is :D Of course, as it is to be expected by Lani Lynn Vale, there are unexpected twists and a suspenseful element that will keep you at the edge of your seats every time you are not drooling after Wade :D The cameo appearances from the other Bear Bottom MC characters and their other halves just made the book even better in my opinion. I so can't wait to read Hoax and Pru's story. And let's not forget Bayou :D In a few words, this is definitely a must read in my opinion. Especially if you are a lover of MC stories or a Lani Lynn Vale fan. And even if you are none of the above, I still think you would enjoy the story immensely. So don't waste any time and pick up your copy now :) I voluntarily read and reviewed an advanced copy of this book. All thoughts and opinions are my own. Lots of surprises, twists and turns!